Region: Central Coast of California, 6 miles south of Hearst Castle. Midway between Los Angeles and San Francisco. 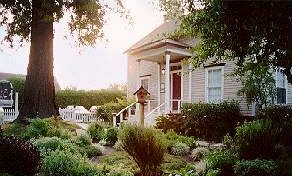 The Olallieberry Inn is a historic home of Greek revival architecture built in 1873, located in the charming village of Cambria. We are walking distance to art galleries, antique shops and excellent restaurants. The Bed and Breakfast has nine guestrooms - six in the historic home and three in the innkeeper's cottage. All rooms have private baths; six of the rooms have fireplaces. Each room has its own style and character and furnished with beautiful wall coverings, fabrics and antiques. In the afternoon we serve a delicious array of hors d'oevres with a choice of wines from local vineyards, and an endless supply of home baked cookies. In the morning you will be served a full gourmet breakfast in our charming gathering room. This and other Cambria Bed and Breakfast Inns can be found here in The Register.